Mark Mercy was the original designer for Stanley Hagler joining in the late 1970s. When Mr. Hagler passed away, he purchased all the stampings, beads and findings from the Hagler estate, which included all of the original Hagler materials, such as the famous Russian gold- filled filigree backings as shown on this piece. Mark Mercy was also featured in the Vintage Fashion and Costume Jewelry magazine, Vol.16, No2, 2006. I am a subscriber to this fine publication. Stanley Hagler has been called the Picasso of costume jewelry and the designs were often mistaken for those of Miriam Haskell. If you take a look at this yummy pin, you will see why. A most elaborate pin, it verges on outrageous! Totally unique in a design created with hand wrapped Swarovski crystals, seed beads, gilt Russian gold- tone metal, rhinestones, carved glass and amazing cabochons. All wired or hand set onto the famous filigree backing. The dramatic top of the piece is completely covered in a collage of the already mentioned materials. I purchased this piece directly from the source and as if I haven’t said enough already, Mr. Mercy is worn by some of the most famous ladies of the day including Susan Lucci, Madeline Albright and Barbara Walters. 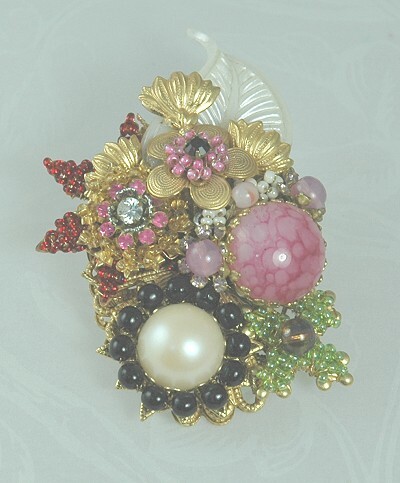 This outstanding brooch is correctly signed "Stanley Hagler N.Y.C." on a cartouche on the reverse. A masterpiece! Condition: Excellent. Measurements: 2 1/4" wide and 2 3/4" long.